Princess Diana, who never got to meet her daughter-in-law, Kate Middleton, still plays an important role in the life of the young royal. Aside from the iconic engagement ring, see the looks in which the two royal women pass off as style twins! 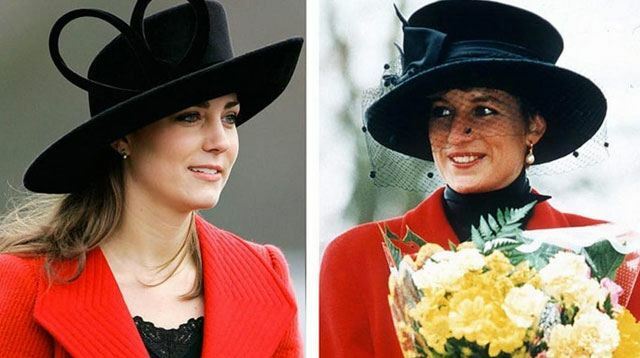 From similar coats to matching hats, Kate has certainly learned a thing or two from her legendary style icon of a mother-in-law. Both royal ladies wore sapphire blue to their engagement announcements to match their rings, with Diana in a bright sapphire blue skirt suit and Catherine in that now-iconic Issa wrap dress. In a red coat and black wide-brimmed hat, Kate channeled her future MIL during her then-boyfriend William's passing out parade at Sandhurst in 2006. These royal ladies sure know their way around the military-inspired look! Here's Kate in an Alexander McQueen set, complete with gold button detailing, while Diana took inspiration from military dress uniforms. Who says polka dots only belong in the '80s? Kate wore a black and white polka dot dress during her pregnancy with Prince George in 2013, recreating a similar look from Diana's own wardrobe, albeit in a more modern silhouette. Kate, seen here in a custom gown by Alexander McQueen during a state dinner in Malaysia, channeled a look that Diana wore to the premiere of the James Bond film The Living Daylights in 1987. For their debuts as royal mothers, Diana and Kate both chose polka dot maternity dresses—Kate in cornflower blue and Diana in emerald green, both photographed on the steps of the Lindo Wing of St. Mary's Hospital with their bundles of joy. While in Malaysia, Kate's near-identical recreation of Diana's outfit got everyone talking. Both wore ice-blue dresses with cloth-covered buttons running down the front, along with matching head scarves. Purple is the color of royalty, and Kate's well aware of this fact. At an event in Canada, the Duchess of Cambridge wore a wrap dress from Issa, and channeled Princess Diana at a gala at The Field Museum of Natural History in Chicago. Diana, who wore her one-shoulder teal evening gown to a dinner in Australia, paired it with her choker strung around her forehead. On the other hand, Kate opted for a more classic look—she kept her teal Jenny Packham gown the star of the show by toning down her accessories. Diana and Kate both stepped out in powder blue double-breasted coats, with Diana coordinating her coat with a dramatic hat and white gloves. Kate's outerwear befits a modern and sophisticated woman, with its sharp silhouette and impeccable tailoring. You can never go wrong with classic tweed skirt suits, both shown here in a royal-approved shade of blue. Diana's had that distinctly '80s longer length and came with a pleated skirt, while Kate wore a slimmed down version that lightly skimmed her frame. These royal ladies prove that black does go with everything! Princess Diana paired her orange skirt suit with a black turtleneck and a shiny belt, which provide a nice contrast to her suit. Kate practically wore the same outfit, except hers came in bold red.